A couple of years ago I wrote the NEXTSTEP version of this game. Don Yacktman did a Mac OS X port based on the NEXTSTEP sources. I also wrote a Windows version. The original ( Sarakon ) version was done on the ATARI ST / Amiga back in 1991. The game idea is based on an Arcade game called Match It. After I’ve discovered the Nintendo DS and the Homebrew scene a couple of weeks ago, it was a clear thing, to port AcChen to the DS :). AcChen is a simple to learn ‘find the matching tile‘ game. It is more Arcade-Style than MahJongg. It contains a lot of different levels. Each level takes only a couple of minutes to finish. Find two items with identical symbols. The tiles will disappear when you can ‘connect’ them with a line, which has two or less corners ( right angles ) in it. Green ways will work ( 2 corners ), red won’t ( 3 corners ). Advance to the next level when the board is cleared. 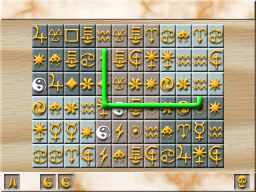 Tiles with the same symbol might be located on top of each other. So the fastest pick ist not always the best. Tiles from the top, mid, and lower layer. Solid tiles can’t be removed. If you pic a pair of YingYang the next picked symbol will be completely removed from the current level. If the YingYang is the last pair of a level you pick, you keep this special for the next level. The bottom menu has three different kind of buttons on it. The left button activates the pause mode - clicking it again will deactivate the pause mode. If you are locked up in a level you can surrender the game with the right button. 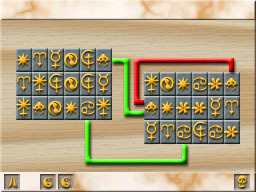 Touching one of the YingYang buttons, selects two ‘working’ tiles in the gamemap. If you touch one of the selected items, the items will disappear. You get an extra YingYang-Hint-Item after finishing a bonuslevel. You can collect a maximum of 5 hint items. Every 5th level is a bonus level. You start with 4 tiles and have to fill up the map. Every time you remove a pair, 4 new tiles will appear. If you manage to fill up the whole map, you receive a 100 point bonus. If the time runs out before, you advance to the next level. After finishing a bonus level you receive an extra YingYang-Hint-Item. Scoring: The first succesful pick scores 0 points. The next pick within 3 seconds, scores 2 points, within 5 seconds 1 point. After finishing a level, the remaining time is added to you score. The ‘highscore list’ and the ‘continue’ feature needs a DLDI patch for your memory device. For more infomation about the DLDI patch visit the DLDIWiki. A big THANK YOU to Kai Gerkens ( http://gerkens.org ) for testing and making th great title gfx! Atari ST puzzle game to DS. Wow ! thankyou so so much for doing this. I’m downloading now - will certainly feedback. but what’d be good would be a “paypal donation” link. i’m happy to contribute to the development of this game. 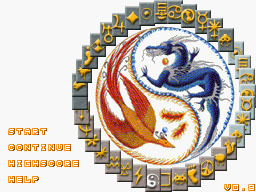 Especially if you could somehow put the extras in that the ST version had - eg the yin yang bonuses, the dragon at the end,the 3 or 4 different bonus screens, and passwords. I’m gibbering in a corner until i download this. My m3 simply card was worth the price just for this. For the love of god, kill the awful sound effects. I can’t even play the game because of how disgusting they are. Did you try Setsuzoku no Puzzle on DS? It’s quite the same puzzle game principle. Yes I like it and play it from time to time. Good game, nice effects! ps i know it’d be real tricky - but what about the flaming dragon finale?